NAIROBI, Kenya, Feb 8 – The third edition of the First Lady’s Half Marathon targets to register 70,000 participants in the forthcoming race slated for March 6. Speaking Monday afternoon at State House, Nairobi, when she received a cheque of Sh15 million from Co-operative Bank Managing Director Dr Gideon Muriuki, First Lady Margaret Kenyatta thanked the financial institution for its support. The First Lady affirmed that she has big dreams to improve the health of women and children in the country. She thanked all well-wishers who have continued to support the forthcoming half marathon saying their efforts would help build a strong team. Dr Muriuki commended the First Lady for her unyielding efforts to improve the lives of Kenyan mothers and children. He said apart from the bank’s financial contribution, he will lead his staff to participate in this year’s First Lady’s half marathon race. “We are proud to walk this journey with you. Last year we had a team of over one hundred staff participating in the half marathon, this year we intend to have even a bigger team,” said Dr Muriuki. 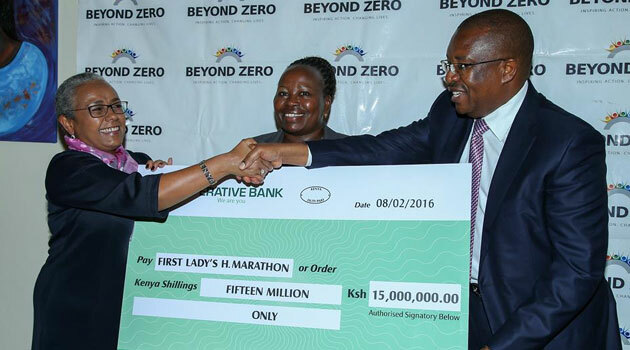 This is the third contribution that the bank is making towards the First Lady’s Half Marathon, having sponsored the event with Sh12 million last year and Sh10 million in 2014. Earlier the First Lady held talks with Prokraft Africa founder Peter Gitonga. Prokraft is East Africa’s first creative talent management agency and represents some of the region’s highest ranking creative professionals in photography and illustrations. Gitonga pledged to support the First Lady’s initiative through advertisement to raise awareness and galvanise support towards achieving her noble goals of the ‘Beyond Zero’ initiative.